This time last year our sporting knowledge team had a bit of a nightmare at the annual Claremorris AFC Sports Quiz. For those who don’t recall (and are too lazy to click the link above), our group was in contention throughout the night before taking the lead after round 8. Alas, we came unstuck in the very next round and collapsed to outside of the top 5 places. This year things didn’t turn out that bad – whilst not being as good either. We seemed to the spend the whole night in third place and where did we end up finishing? Yup, third place. We did have an enjoyable night all round. 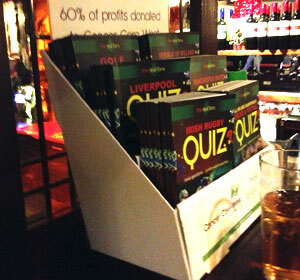 This started in the bar before-hand, where we encountered a novel form of fundraising: quiz books! 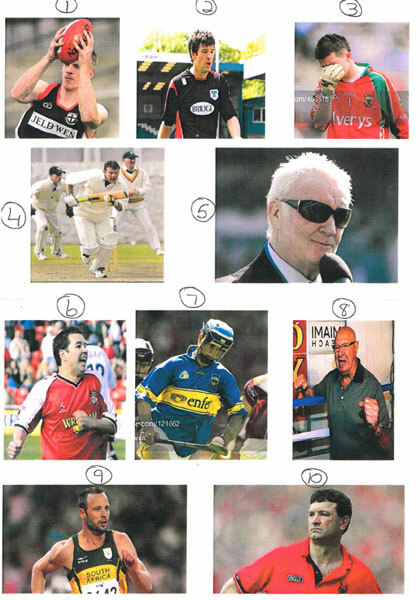 Cancer Care West are selling a series of sports trivia quiz books as a money raiser. Pick up one if you see them as they’re a great idea. Then again, I might be biased! The main event was very nicely run. Unfortunately for the organisers there wasn’t a huge crowd in. Somewhere in the region of 14 tables took part in what is normally a sell-out event. Consensus decided that a rival sports club’s running of a poker night across town was largely to blame for this. The questions were nice and varied, albeit this year struck us as a little easy. We ended up scoring 92/100 and that left us two points behind the teams who had finished joint-first. (See below for play-off questions). It was one of those nights though where it was very hard to pull back dropped points as several tables were scoring top points on most rounds. Which winning distance was longer in the 2012 Summer Olympics: Men’s Discus or Women’s Discus? Who is Aston Villa’s captain for the 2012/13 season? Patrick Viera received 8 red cards in his English Premier League career. This puts him in joint-first in the list of red cards with which Irish player? How many All-Ireland senior championship medals does Henry Shefflin have? In what year did the first hosting of the Boston Marathon, the world’s oldest, take place? At the start of the 2012 Formula One season, the grid featured six previous world champions. Name them. How many clubs took part in the 2011/12 FA Cup? In what year did Offaly win the All-Ireland Hurling title via the ‘back door’? In 2007 Portsmouth and Reading set the record for the game with the most goals in the FA Premier League. How many goals were scored in total? * We were told that two of these people are related, which indeed they are.